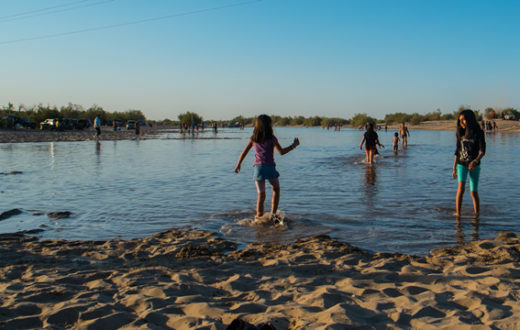 Arizona remains in a lingering drought, and with the structural over use of the Colorado River, more must be done to support the river and keep Arizona’s water supply out of shortage. Passage of a Drought Contingency Plan is an important step for the preservation of Lake Mead water levels. We all know that Arizona lies in a big, dry, desert – yet we still love living here and making this state our home! 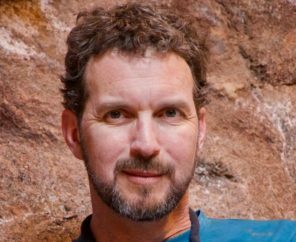 But the beautiful landscape and economic vitality that supports the unique Arizonan lifestyle is fueled by our supply of water, and that supply is in jeopardy. 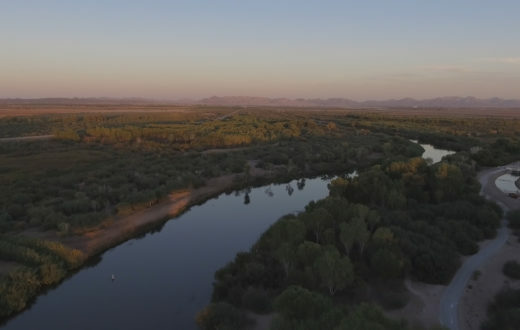 Nearly half of Arizona’s water is provided by the Colorado River via the Central Arizona Project (CAP) canal. That’s drinking water for people, irrigation water for farms, ranches, and wineries, water for businesses and towns that keep Arizona’s economy humming, and water for our abundant wildlife and natural heritage. Our supply of Colorado River water is measured and managed by levels in Lake Mead, on our northern border with Nevada. Due to drought and dramatic overuse in the Southwest, Lake Mead has been dropping quickly, even with hefty snowpack in Colorado, Utah, and Wyoming over the past few winters – the mountains simply cannot keep up with overuse by Arizona and surrounding states. 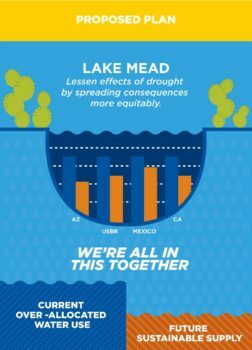 This imbalance is why leaders and elected officials from California, Arizona, and Nevada, along with the U.S. and Mexican governments, have come together to negotiate a deal that will work hand-in-hand to store more water in Lake Mead, and will ensure participation from each of the states on a formal basis. This agreement is called the Drought Contingency Plan, or DCP, and we need to get it done! Under Bureau of Reclamation operating guidelines for the river, Lake Mead must be maintained at an elevation of at least 1,075 feet, and in recent years with a combination of overuse and the effects of drought, the lake has barely stayed above that level. If it drops below 1,075 feet, mandatory cutbacks could be first imposed upon Arizona, with other states being penalized later. Deeper cuts are possible if the lake level drops further. These cuts would create significant risks, especially for the agriculture and development sectors of our state’s economy who will be the first to see their water supplies reduced. The impacts wouldn’t be evenly felt; some communities and natural resources would suffer more than others. No great feat of engineering is going to help us out of this predicament – however our ingenuity can help us find a way. 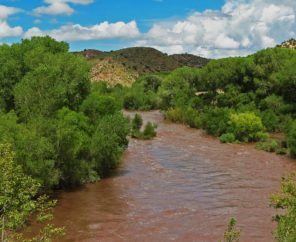 Instead we must look to policies and conservation measures governing water use in the lower Colorado River Basin. The DCP does just that by forging a series of agreements, enforceable between the three states, to share investments in these conservation measures, as well as the benefits. The DCP will balance our water system and make us more resilient to future shortages, as well as provide a mechanism for future agreements to secure sustainability across the entire southwest. It is truly a win for Arizona, and a path forward for all three states. 1) Protects Arizona water users from drastic, involuntary reductions, and provides for gradual reductions through voluntary water exchanges and conservation. 2) Encourages the three states, with additional help from the country of Mexico, to voluntarily keep more water in Lake Mead, working together to avoid dropping below the 1,075 feet elevation threshold. 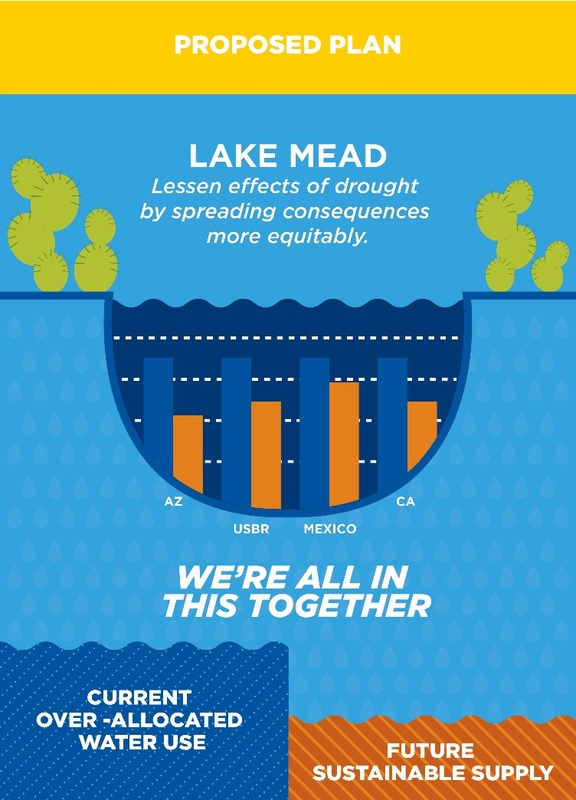 3) Joins all three states (and the U.S. government) in collective responsibility to protect Lake Mead’s water, especially if lake levels continue to drop – and provides for the first time that California will share in some of the water reductions. 4) Provides incentives for states, especially California and Arizona, to store some of its extra water, known as “surplus” or “excess” in Lake Mead, when it has it. As states conserve more, and with the blessing of abundant winter snows, Lake Mead can rise again – especially if we help it do so. 5) And lastly, the DCP works towards a collaborative management solution between the states and federal government, with the health of Lake Mead as a top, stated priority. 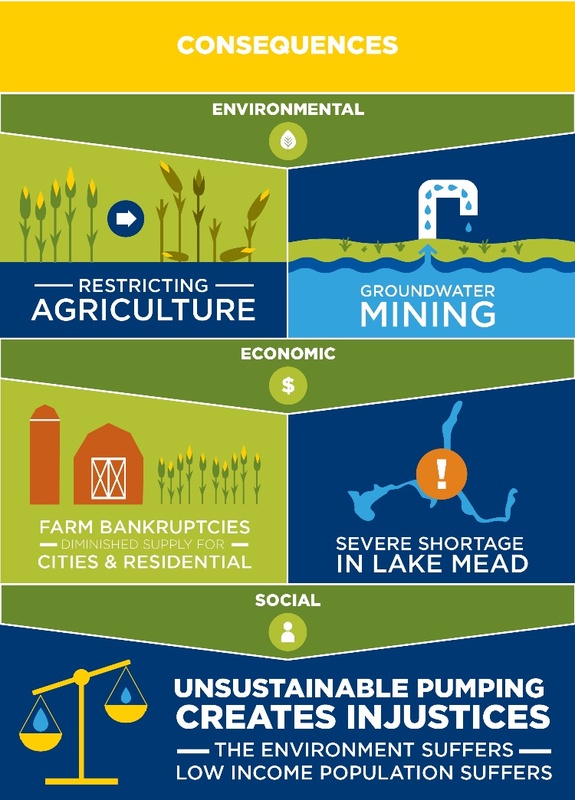 1) Support the Drought Contingency Plan (DCP): The Lower Colorado Basin DCP is a proposal currently under consideration that aims to protect Lake Mead’s elevation from dropping to critical levels that would reduce Arizona’s water supplies. The Coalition is working to get it authorized by the Legislature and signed by AZ, CA, NV and the Bureau of Reclamation. 2) Support an Arizona DCP-Plus Plan: DCP-Plus is an Arizona-only plan to keep Lake Mead elevation above 1,080’ and delay or prevent future shortage declarations that could take out roughly one-third of Central Arizona’s Colorado River supplies. DCP-Plus would incentivize reductions in water use and water storage programs so that unused water can be safely stored in Lake Mead. 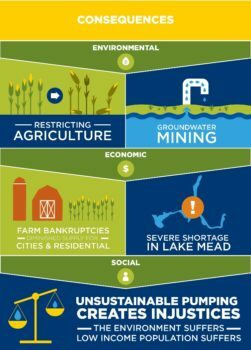 To enact the Plan, the Coalition believes we need an ‘Excess Water’ compromise that helps both the River Counties where CAP seeks to buy and transfer new water supplies, and for others who depend on the economic vitality created by a secure Colorado River supply. 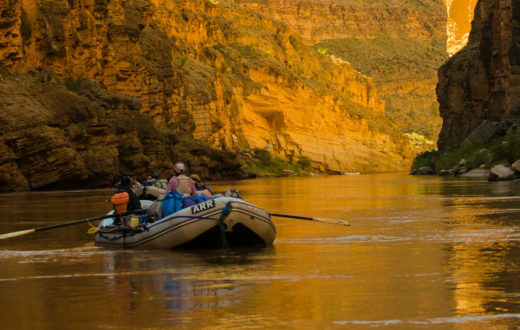 3) Support an Arizona Colorado River Conservation Plan: Such a plan would establish an ongoing and collaborative process to ensure Lake Mead elevations are always protected. 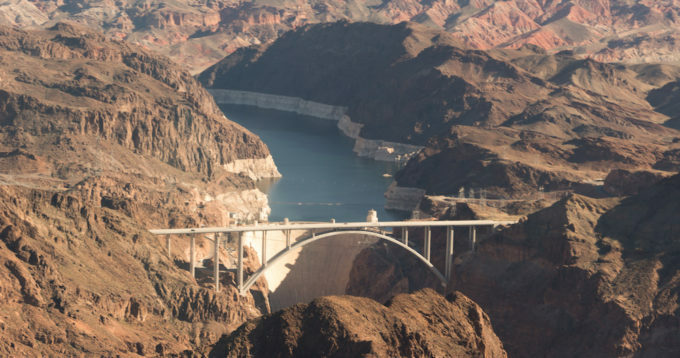 The plan would estimate conservation volumes needed on a yearly basis to ensure Lake Mead elevations do not fall to the point at which Arizona will experience harmful shortages. The Coalition supports a plan that would assure water users that the water they choose to forbear and conserve in Lake Mead will benefit all Arizonans, and not be consumed by another water user. The deal is not final yet. Completing DCP negotiations is key to protecting Lake Mead from future shortages. And most importantly, it reminds residents and business interests across all three states that we are all in this together, and by acting boldly, we can sustain our lifestyle, economy, and rivers and wildlife of the Southwest for generations to come. For more information on broader Colorado River issues in the lower basin, please visit our Lower Colorado webpage. That sounds like the “Do Nothing” plan. I would rather work with the “Do Something” plan. It isn’t an all or nothing game. Compromises that extend our water supply sound pretty good to me. There are people willing to do the organizing, adminisrating, and implementing. There are others who (for whatever reason?) just want to say NO. can someone explain to me why we are not using a water pipeline system from the northern states and Canada who get snow during the winter and just flows aimlessly when it melts. we are using pipelines for oil why not water? 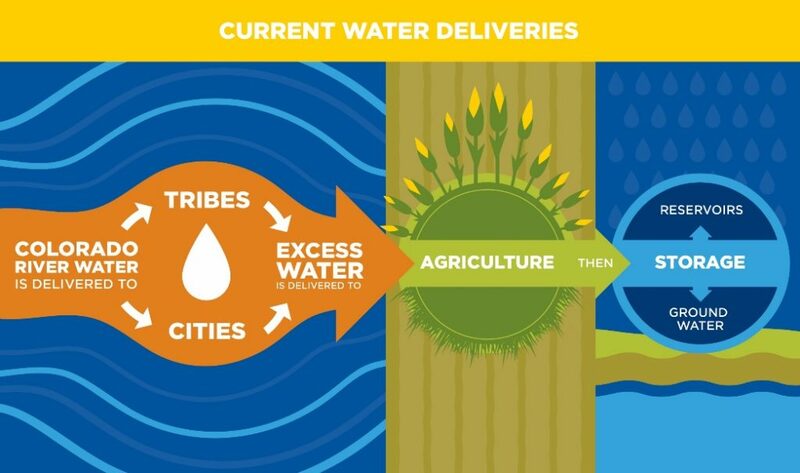 after all, if we do not get water, we won’t have to worry about oil or anything else!! I live in Yuma for part of the year. I see open canals everywhere. Absurd! Everything should be piped to prevent unnecessary loss. Could you explain more the graph about CAP average deliveries : does it mean that if Lake Mead drops at a level of 1050 feet, surbuban growth and 3/4 of Central Arizona agriculture won’t receive their CAP water allocation anymore ? I live in Eloy, AZ, where flood irrigation of cotton and feed crops for cattle is widespread. My understanding is that when the CAP was built, in order to get the California legislators to sign on to this massive federally subsidized project, AZ made a deal that in drought (which our delegates thought was hypothetical at the time) AZ would be the first to lose CAP water. Now here we are in 2018 with the snow pack in the mountains that feed the Colorado Basin at very low levels except in the very upper basin, north of Flaming Gorge Dam. 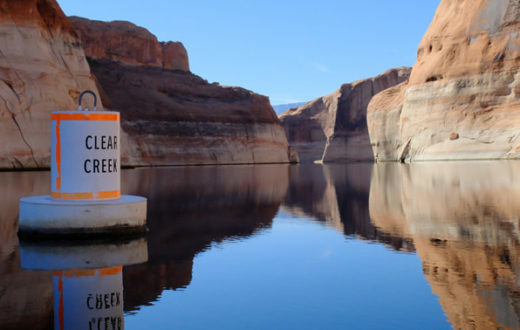 Lake Mead and Lake Powell are going to suffer very low inputs. Storing water in giant evaporation ponds was a bad idea from the get-go. It is worse in prolonged drought cycles. Let’s just get used to the idea of drought, and that intensively irrigated agriculture in the southwest is a thing of the past. Groundwater is not an option, we’ve already tapped that to death. Growth – urban, suburban, or rural – is a thing of the past for the southwest. Flood irrigation is a thing of the past. That’s the reality, and the sooner the people of Arizona grasp it, the sooner we can adapt to a very dry future.